Nobel prize winner Günter Grass (1927-10-16 2015-04-13 age:87) wrote this poem about Israel, nuclear war and Iran. 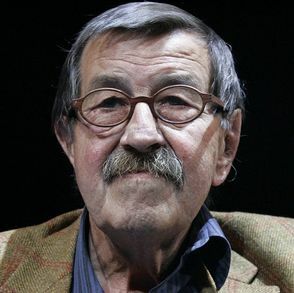 Günter Grass, warns in the Sueddeutsche Zeitung of a war against Iran. In his poem titled What must be said the Nobel literature requests that Germany refuse to sell submarines to Israel. To Israel’s shame, they interpreted this poem as hate literature and barred Grass from entering Israel. the verdict Anti-semitism falls easily. existence proof enough, I’ll say what must be said. das Verdikt “Antisemitismus’ ist geläufig. sage ich, was gesagt werden muß. Warum aber schwieg ich bislang? von den Regierungen beider Länder zugelassen wird. und letztlich auch uns zu helfen. I polished the Google German to English to German translation with my one year of high school German. When I was a teen I greatly admired Ralph Mannheim’s translation of Grass’s The Tin Drum . Unfortunately this translation is nowhere near his quality. In fact I suspect it ranks up there with Monty Python’s Bulgarian phrasebook. I came across a translation that bore no relation the the German, then the Breon translation, which I have posted now.